Benavidez leads an active career as a performer and educator. He is assistant professor of tuba and euphonium at Florida State University and previously held a similar professorship at the Ithaca College School of Music. In the summer, he is tuba-artist faculty at the Round Top Festival Institute in Texas. An acclaimed international solo artist, Benavidez has performed in venues throughout North America, Europe, and Asia. His debut solo album, Emblems, won silver medals in the “Classical Album” and “Instrumental Solo Album” categories of the 2018 Global Music Awards. Rave reviews note the “tremendous virtuosity, stylistic versatility, and expression throughout, making for an impressive and highly entertaining record” (ITEA Journal). 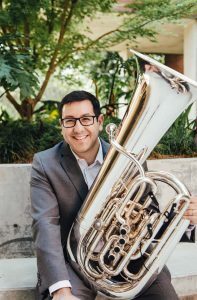 Benavidez was the first tubist to receive both the New Horizons Fellowship and the Orchestral Fellowship at the Aspen Music Festival, where he held the principal tuba chair in the festival orchestra and was the winner of the prestigious Aspen Music Festival Concerto Competition. He was a distinguished recipient of the Horace H. Rackham Merit Fellowship for doctoral studies at the University of Michigan. Benavidez is one of today’s leading educators, regularly presenting master classes at preeminent schools of music, workshops, conferences, and symposia. Notable invitations have included the University of Michigan, Indiana University, the University of Texas at Austin, the University of North Texas, the Kunitachi College of Music in Tokyo, the Paris Conservatory, the Lyon Conservatory, and the Bern University of the Arts. Benavidez is a Meinl Weston performing artist.